In this article, we simply wish to focus on the ‘Pastoral’ conduct of Phil Pringle and Kong Hee. Thanks to CHC’s Advisory Pastor Phil Pringle, this issue is further expanding across into other countries as ‘pastors’ lend their support and praise to Kong Hee and Sun Ho. 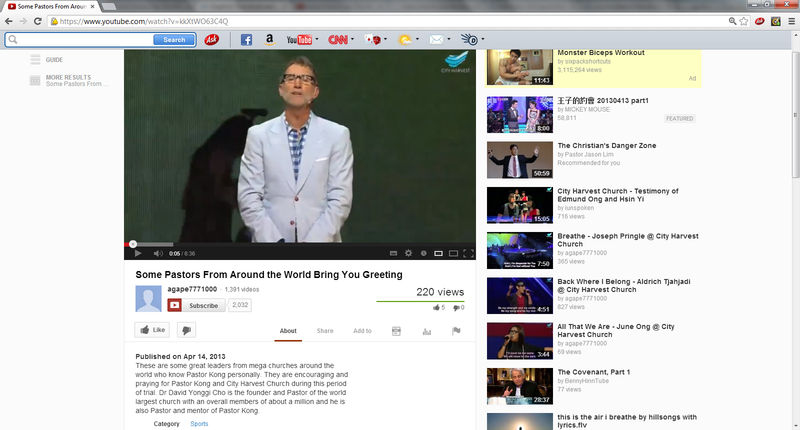 Just recently, a video surfaced on YouTube that filmed Phil Pringle saying that he “got some pastors from around the world to bring” CHC ‘greetings’. Here is the video. “These are some great leaders from mega churches around the world who know Pastor Kong personally. They are encouraging and praying for Pastor Kong and City Harvest Church during this period of trial. Dr David Yonggi Cho is the founder and Pastor of the world largest church with an overall members of about a million and he is also Pastor and mentor of Pastor Kong.” – Some Pastors From Around the World Bring You Greeting, https://www.youtube.com/watch?v=kkXtWO63C4Q, Published on Apr 14, 2013. In response to the above YouTube clip, a new YouTube video emerged juxtaposing the pastors endorsements against Sun Ho’s music video clip ‘China Wine’. The contrast is stunning and disturbing. The second thing this video exposes how ‘Christian Pastors’ are promoting human depravity in the name, glory and Spirit of Jesus Christ. As the parody pits the pastors against the China Wine music video, one can’t help but wonder if Phil Pringle, Kong Hee or Sun Ho have been fully honest with their fellow pastors. For instance, would John Bevere say that God put scriptures on ‘integrity’ in his heart if he saw Sun Ho dancing erotically in her music video clip China Wine? Would Mark Conner say that his church is “inspired” by Sun Ho and Kong Hee’s “life” if he saw Sun’s music video clip ‘Kill Bill’ that has her singing about murdering her boyfriend? Now that Phil Pringle made the video, we should be asking ourselves if the churches of Yonggi Cho, John Bevere, Mark Conner, Jeffrey Rachmat, Paul Scanlon and Casey Treat have given Kong Hee a platform to receive ‘love offerings’ to financially support his case. This scandal needs to be a prayer issue for Christians everywhere. Please pray that Christians have their eyes opened to the immoral conduct of these pastors. Pray that no more Christians are “snookered” by their own “idolatrous notions” regarding the behaviour of Kong Hee, Sun Ho, Phil Pringle and other ‘ministers’ who endorse the moral conduct of these ministries. Pray that Christians everywhere have their eyes opened to the whole truth about the ongoing pastoral and legal issues involved around Kong Hee AND David Yonggi Cho. Ha, someone’s put a lot of effort into that. Iv’e been trying to show a C3 goer the China Wine vid, but every time i do the response is either:It’s been doctored, or that it is all lies and it has nothing to do the original case. The person i know even brought back from the presence conference, more of these chinese whispers. Completely foolish to believe rumours instead of facts. C3 goers that agree with Kong and Pringle are just playing a game of simon says,and Pringle is simon, so whatever he says, the sheeple must do. An answer that that reveals a mindset typically possessed by those who have been brain-washed by a cult: they ignore anything and everything that is contrary to the position they have adopted, whether Scripture, or evidence, or logic, or even just plain common sense. The question arises as to whether such people are really sheep who have been led astray, or whether they are in fact goats who are getting exactly what they want (and, by extension, just what they deserve). Whatever the case, they are going to get a nasty shock on the Day of Judgement – and the Phil Pringles of this world are going to pay dearly for the part they have played in deceiving so many. Cults followers tend to regard their pastors as some kind of infallible annointed that can do no wrong. They have this fear of judgement if they touch the annointed. I am glad our Christians fathers of old did not blindly follow the Pope. Otherwise we would all still remain Roman Catholics. When biblical truth matters little, cult flourishes. But not all are gullible. A pastor in Malaysia was reported to have warned its members against getting drunk with China Wine. As a non-C3 member, here’s my 2 cents worth. This so called “cult” organization at the very least have been doing good and helping the poor. I read up on news and stuff to come to this. And to a fellow Christian it’s contributing to society. They may preach on topics sensitive to traditional beliefs, but that doesn’t prove they are a cult. Calling others a cult does not make anyone superior to them. Judging others behind a computer isn’t a very proud thing as well. For example this C3watch who is also garnering it’s fair share of C3 “haters”, can be also a “cult” because it’s spreading it’s own beliefs upon people isn’t it? Then isn’t everything else that promotes it’s belief a cult as well? I have done my part in helping the needy and I don’t see myself fit saying what Phil Pringle does is wrong or the beliefs his congregation adopts are wrong. As a Christian, I only hope for the truth to prevail. If his teaching is genuinely wrong, then may God deal with it in His timing. It seems like you need to sharpen up those research skills, D. J. – C3 is indeed a cult (of the the prosperity / personality variety). You should be aware that many who comment here have first-hand experience of C3, and are thus well-qualified to comment on the true nature of the organisation. It appears that some C3 churches are not quite as bad as others, but you can rest assured that C3 Oxford Falls is a bitter root, and that Phil Pringle’s perverted “theology”, noxious preaching, and noisome attitudes tend to permeate his movement and poison any good thing in their path. (In fact I have recently spoken to someone who recounted an anecdote regarding an encounter that they once had with Phil Pringle, and how that encounter, revealing as it did Phil’s true nature, left a lasting impression that was starkly negative). Perhaps you need to have a spell being hectored by a know-nothing C3 “leader” who spends a disproportionate amount of his time badgering you about how you need to give him your money so that you can be “blessed”. If you ever happen to be in Sydney, you should consider visiting C3OF so that you can see for yourself what a pathetic and shallow show it is that they call “church”, and what a pack of vain, self-indulgent navel-gazers they are. I’ve no doubt that you’d change your tune pretty quickly. Why don’t you try asking exactly which bits of the video have been doctored, and in what manner (maybe they used a clone of Sun Ho?). Ask the C3 member in question if they can show you the original music video in order to establish the truth of their assertion. I would be interested to know the sort of response that you would draw as a result. EYES – perhaps you could ask your friend to watch this recent message from Dr. Paul Choo, an influential Singaporean pastor with some thoughts on Kong Hee and the culture of City Harvest Church. For what it’s worth, there were some WOF pastors (Judah Smith being one of them) shocked to see the China Wine youtube clip when it first came out a few years ago. When asked for an explanation, the response from a certain advisory pastor was “they’re good people”. In regards to your C3 friend, maybe we are starting to see “the strong delusion” we are warned about in 2 Thessalonians 2:9-12? I used to spend a good part of my life with City Harvest, but have left since. There is a deafening silence from Pastor Ulf Ekman, once said to be KongHee’s discipler. I suspect the pastors did not know about Sun’s cross-over projects just like my freinds and I who used to attend CHC. We were told by pastors that Sun was in American doing works for God but we were unware of the type of MTV she was recording. A feast is made for laughter, wine makes life merry, and money is the answer for everything. The basis of CHC principle is simple: Worship Money, for that’s their answer to everything. They live a life of luxury and their followers worry that they do not have money to pay their own legal fees and started a private fund rising after their recent AGM (Source: Yahoo News Singapore). The outcome of this trial will not turn these group of people towards the truth that can set them free, since they have chosen their path of worship. Can anyone bring forth a scripture in the Holy Bible that says,,MONEY INCREASES THE KINGDOM OF HEAVEN?? Know this, my beloved brotherse: let every person be quick to hear, slow to speak, slow to anger; for the anger of man does not produce the righteousness of God. Doing good does not mean they are not Cult. The are many Christian Cult who help the poor…but nevertheless brainwash their members. If I am a crook, I certain will do some good for show…afterall, satan came as angel of light too. If I am a Cult leader, I too want to help the vulnerable groups…easier to control! ; plus put forward some high profiles people(with self interest) as followers(again for ). Then, just wait for the group to grow and followers who UNQUESTIONABLE follow me. Halleluya…soon I will be rich and/or adored! If people ask questions, I will say “Don’t touch the Anointed one OK!” Sound familiar….